Arnaud Faye joined the team at Château de la Chèvre d’Or in July 2016 to oversee all of our restaurants and mainly our two Michelin stars restaurant LA CHEVRE D’OR. 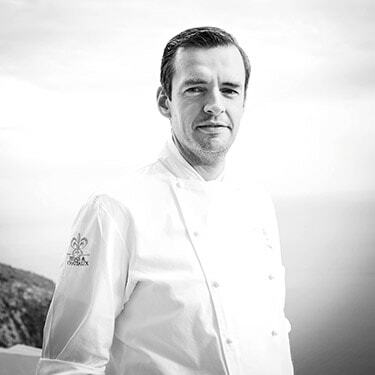 He began his career in 1999 and worked successively in renowned institutions, all with three Michelin stars, such as Arnsbourg in Baarenthal, Antoine Westermann’s Buerehiesel and Bernard Loiseau’s Relais. In 2007, at only 29 years of age, Arnaud Faye was appointed Head Chef at l’Espadon, in the famous Parisian palace « The Ritz ». Two years later, the restaurant received its second Michelin star. In early 2011, Arnaud Faye joined the newly opened Mandarin Oriental in Paris. Less than a year after opening, the Mandarin Oriental, Paris obtained 2 Michelin stars. During the year of 2012 he took on a new challenge: to oversee the kitchens of the Auberge du Jeu de Paume Hotel, a member of the Relais & Châteaux association and the property of His Highness the Prince Aga Khan, in the heart of the Domaine de Chantilly. The hotel’s gourmet restaurant was awarded a Michelin star in March 2013 and the second came the following year. They were maintained in 2015 and 2016. At the 2 Michelin starred Chèvre d’Or restaurant, Arnaud Faye celebrates the authenticity of an exceptional countryside extending from the rocky foothills of Mercantour to the intense blue of the Mediterranean. The menu is inspired by contrasts and emphasises the products of the Riviera, as well as the hinterland.